Pakistan Army is the power of Pakistan and career in Pak Army is considered a dream come true for those who love Pakistan. Every person who joins PAK army feels proud. They serve the nation, the people of the world in every harsh condition. There are shinning career opportunities for youngsters in Pakistan Army. They can serve in Pak Army in a different perspective because there are many jobs for males and females in Pakistan armed forces. Excellent career opportunities in Pakistan Army are offered to the talented youth in different fields. A huge number of students apply for Pak army. There is an organize system of promotion and increment. Officers are promoted through a standard procedure of rules and regulation. Pakistan Army is not a profession but a way of life. It is for those who want leadership abilities and who have the dare to join it. Army gives you opportunity to defend and serve the motherland like no one can do. 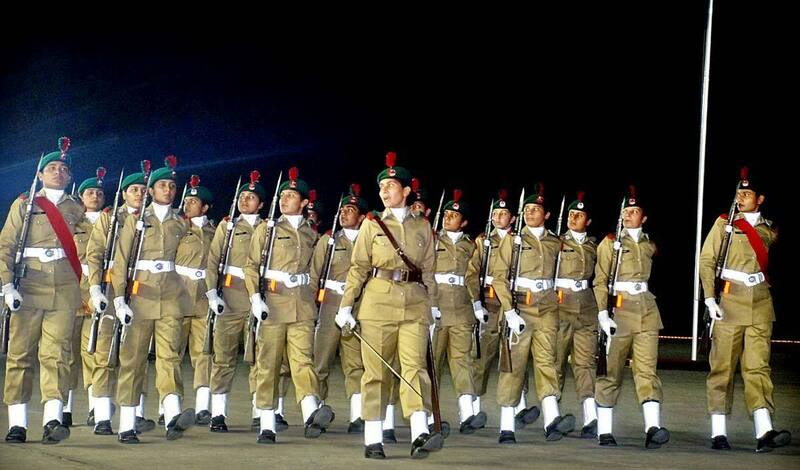 Armed Forces are perfect specimen of Quaid’s motto Unity Faith and Discipline. Therefore it is important that you should follow discipline in your life. Besides disciples you should also possess some qualities if you want to join Pak Army. These qualities are: Loyalty, Respect, Self Service, Integrity, and Personal Courage. If you have all these attributes then you can join this unique profession. Here are given details about joining Pakistan Army after intermediate. Marital Status: Female unmarried / widow / separated divorcee without encumbrances. Training period: 4 years BSc Nursing Training at AFPGMI Rawalpindi. After successful completion of training, shall be granted Commission in the rank of Lieutenant. Marital Status: Unmarried (Married serving personnel of the Armed Forces over 20 years of age are eligible). Qualification: FSc (Pre Engineering) Physics, Mathematics, Chemistry / Computer Studies / Computer Science with minimum 65% marks or ‘O’ level passed (English being compulsory) in five subjects and ‘A’ level passed in Mathematics, Physics and Chemistry / Computer Studies/Computer Science in Grade A-C.
Training: A candidate is required to complete one year military training at PMA Kakul, after obtaining Bachelor of Engineering (BE) Degree. Qualification: FSc (Pre-medical) with minimum 70% marks or “A” level passed in Biology, Physics and Chemistry with minimum grade C.
Training: After completing 4 to 5 years of study, 22 x Weeks Basic Military Training (BMT) at PMA Kakul after completion of final professional examination. Declared medically unfit by Military Hospital/ Appeal Medical Board. Enrolled cadets and recruits withdrawn/ resigned /discharged/ dismissed from Armed Forces (Army, Navy & Air Force) training academies/institutions on the grounds of discipline, character, medical, inefficiency, weak profile, or declared unsuitable. An individual dismissed/removed from any other government service. Convicted by a Court of Law for an offense involving moral turpitude. I have passed part 1 fcs with 61%marks and recently before 2 i will admission in part2.and remaining months for exam is 5 months can i apply for pma long cource as officer? I am completing my education in DAE civil from govt polytechnic Institute haripur KPK. After ics…can I join pak army?? sir.i got 81% in FSC(pre- engineering)part 1 .. sir now when will the admissions open??? My name is Waseem Akram. i’m 21 yrs old. I passed matricultion Examination with 84% marks and F.Sc with 57% marks. Can i apply for 2nd Leftinent ? How much percentage is required in FSc to join PAK ARMY as commissioned officer? Sir mary matric ma 77% ha or 1st year ma 70% ha can i join army girls ky liy koi seat ha. Ma pre engineering ki student hon. sir I was passes my matric with79·/· and I am in fsc pre medical I was done my papers of first year and waiting for result and now I am in 2nd year …..can I apply pak army after fsc….. sir plzz replyy…. Aoa… I have done m matric at 69% and FSc at 58.27% can i apply for the PMA LC… I m frm punjab.. ?? Recently i passes the matric with 59% marks. Can you plz tell me.How can i join pak army?? Please some one guide me. 03060433493 My contact and whatsapp num. Sir what about fee of AFNS ?four years m kitni money require h…R lutient ki pay kitni hti?? can u please tell me how can i join pak army as a leutinent ? ?